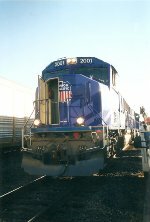 Description: UP "Olympic Torch Relay" SD70M's 2001 and 2002 prepare to depart White Siding and lead NS 225 west through Memphis on April 14, 2002. Description: Painted for the 2002 Winter Olympic Games Torch Relay Train, UP SD70Ms 2001 and 2002 were released back into the freight pool following their special assignment. On August 20th, 2003, UP 2001 (the former UP 4690) leads the power from train ILDLB-17 south of Dolores Yard in Carson, California. Description: Q20406 with UP 2001 gets a fresh crew at Owensboro, seen here passing the hospital. Description: UP 2001 and UP 3662 head up this Q20406 with 50 autoracks. Title: In-Cab of UP 2001. Description: UP 2001 had just dogged here.